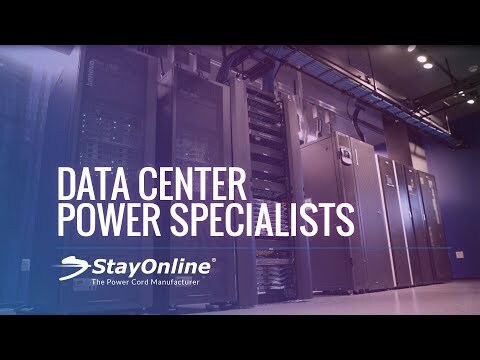 StayOnLine – The Power CordManufacturer. Stay Online has the largest instock selection of power cords and plug adapters in the world including IEC60320, IEC 60309, NEMA Straight Blade, NEMA Twist Lock, Non NEMA 50 amp, andInternational standards. Whether for your data center or an industrialapplication, we have your cord. Their custom cord set, powersupply cord, plug adapter, portable outlet box, power cord stringer and powerdistribution whips capabilities are the best in the industry. They have designed a number ofunique products to meet our industry's needs: Cage Tool, Secure Sleeves, firstto market with colored cords to differentiate redundant power paths, surgeprotectors with any length cord up to 25 feet, RJ-45 loop back plugs wired toyour application, rack mount fan panels with intake and exhaust versions, andfeed-thru patch panels in colors to identify cable runs are a few examples ofthe unique products we offer. And distribute innovative productsfrom top manufacturers such as Hubbell marine receptacles, IEC Lock C13 lockingoutlets, C19 locking outlets, C14 locking cords, and C20 locking cords, Zonitmini auto transfer switches, and more. To meet your design or repair needsthey have an extensive offering of electrical boxes, plugs, connectors,receptacles, outlets, inlets, cord connectors, cord reels, and wire grips. StayOnline has the largestin-stock selection of power cords and plug adapters in the world which DPBuilding Sysems fully stock.